trying for sighs: my most embarrassing moment! I still cringe when I think of my most embarrassing moment! I have tried desperately to block this event out of my mind but here I am airing it for you all to see! Believe me, you will be cringing to by the time you have finished reading this! I was eleven years old at the time and it was announced at school that there was to be a swimming gala. Anyone who wanted to take part had to choose which stroke they wanted to do and take part in a race. If you won, you got to be in the gala. I was really excited and wanted to take part, even though I hadn't had lessons and had taught myself to swim at the local baths. The worst thing was I couldn't dive, so this left me at a disadvantage. My dad used to take me to the baths with him and go off and swim, and that's when I tried to teach myself! When I look back I think I wanted to gain approval from him as we weren't very close. I got through to the gala and was so excited when my dad said he would come and watch me! The leisure centre was really busy, not a seat spare anywhere. I don't like being the center of attention so when I saw all those people I suddenly felt very scared. My team were all doing really well and when it was my turn I remember a boy coming up to me saying 'You'd better win.' No pressure there then! As I couldn't dive (why did I do this!) I had to get in the pool and wait for the bell. Of course everyone got a head start on me and I was last. I was doing the crawl and I was alright for a couple of strokes. Then, all of a sudden, I got tangled up in something; I panicked and started thrashing about in the water. It felt like I was in that state for a long time but it must have only been a couple of minutes. When I came up for air I realised I had got caught up in the ropes separating the lanes! All I could hear was silence! Not a sound to be heard! I contemplated getting out but I thought I would save face by swimming to the end. Swimming that length with just me in the water, and all those people watching, was the most embarrassing thing ever! I got to the end, got out and everyone looked at me with disapproval. I remember looking up at my dad and he wouldn't catch my eye. I could tell I had embarrassed him. We never spoke of it again. 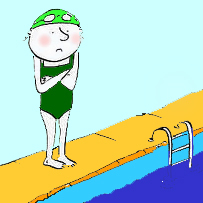 I never took part in swimming galas again; even today I'm not a fan of swimming. I'm off to wipe the beads of sweat off my forehead to calm me down as I'm getting hot and bothered thinking about it! Would you have felt as embarrassed as me? i commend you for being so brave to swim all alone and still finish the race. Awww thanks, that race felt like a long time! My dad didn't do hugs unfortunately! I'm sure it would have made me feel a little better. Oh that's awful! I would have cried too! We all take things to heart more as teenagers, I think. Hey, at least you finished. I prob would have just swam to the side and waited for someone to rescue me. Fortunately, after quitting the swim team in high school, I gained a lot more confidence, and now I swim for PT weekly and love it. I still want to curl into a ball when I think of it! Maybe if I had kept it up I would have gained more confidence too.